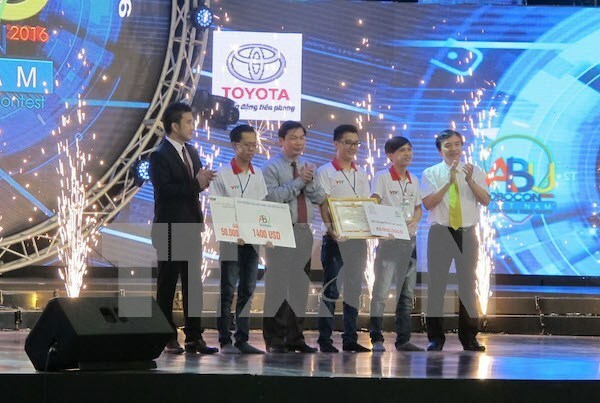 Ninh Binh (VNA) – The Lac Hong University’s LH-FF team successfully overcame 31 other competitors to become winner at the Robocon Vietnam 2016 final, which took place in the northern province of Ninh Binh on May 14. The university had three teams entering the final round. The LH-ACE ranked second while the LH-F team shared the third prize with a team of the Tran Dai Nghia University . The organsing board also presented several awards for outstanding teams at the final, including prizes for creative team, and eco robot. The 2016 Robocon Vietnam is the 15th of its kind held so far in Vietnam. The winner will represent Vietnam at the Asian Pacific Robot Contest (ABU) which is scheduled for August in Thailand .